Kristen Upton wanted to be a keeper when she was younger, but she didn’t want to stand still. 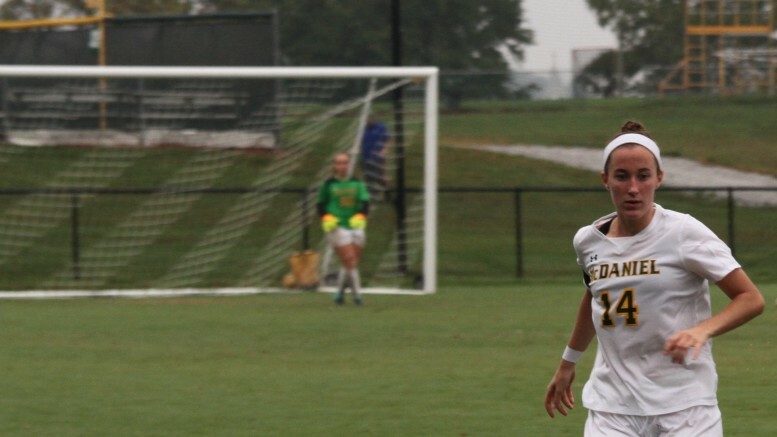 Years later, she’s made due by captaining McDaniel’s renowned women’s soccer defense. The senior captain and four-year women’s soccer starter has been playing soccer since she was four. “I wanted to be like my sister and she was playing so I signed up as well,” said Upton. By second grade, Upton was playing on a travel team as her interest in the sport surged. It took until high school, however, for the Chalfont, Pa. native to commit to playing as long as she could. Her search to find an institution that could offer her the right kind of education and a chance to play soccer began. Upton then reached out to colleges that she expected to be at one of her tournaments, hoping to hear back from as many coaches as possible. Upton kicked off her freshman year as a starter for Lagana’s team and hasn’t looked back. “She’s so mentally tough so she was able to elevate her game so quickly,” said Lagana. By her sophomore year, Upton and her team found themselves in the NCAA National Tournament, playing on the pitch against Oneonta in Pittsburgh. “It was super exciting but I was also nervous because we didn’t know what to expect,” Upton said. A year later, they did it all again, this time hosting the first round in Westminster before travelling to Boston after a pair of wins. Despite a tough game against Brandeis, the nerves didn’t have an impact like they did in Pittsburgh for Upton. “We felt like we were supposed to be there,” she said. Soccer wasn’t all that helped Upton settle on McDaniel, however. The senior joined the college as a member of the Honors Program, which recognized her high school achievements and future success at McDaniel. It’s paid off well for both parties. Since starting her academic and athletic careers as a Green Terror, Upton has been recognized by the Centennial Conference as a first-team athlete, scholar athlete, and first team all-region by the NCAA, and academic all-American. The exercise chemistry major has also found a role model in chemistry professor and women’s soccer faculty mentor Dana Ferraris. “I can’t say enough good things about her,” he said. “She’s exceptional. 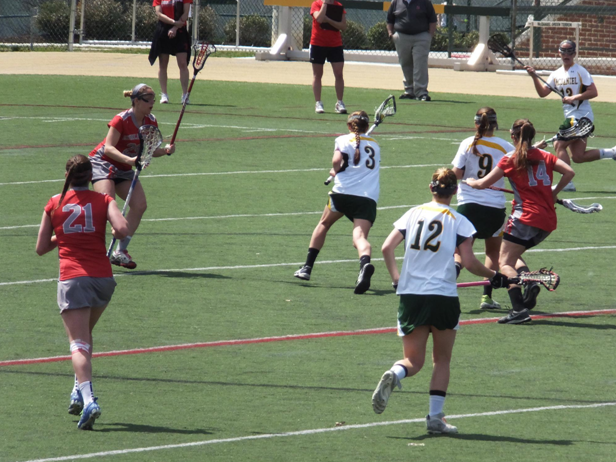 The 5-9 defender is known for scoring goals just as she is her academic accomplishments. In her sophomore season, Upton found the back of the net seven times to score the fourth-most goals on the team. She’s since scored six more and has a total of 15 next to her name, most of them as a finishing touch from a corner kick cross. Fellow senior captain Abby Keen is Upton’s most popular assist, taking most of the team’s corner kicks. Lagana sees Upton’s headers as something special. “It’s something that we’ve done at least as long as [she’s] has been here,” said Lagana. Teammates have taken note of what Upton can do and have followed suit. Ferraris has noted Upton’s supportive style in her leadership. “You see her out there and know she won’t say anything negative. She’s all supportive,” he said. Upton’s leadership has also shown through academically. With her eyes set on medical school, she’s been the go-to person at McDaniel for underclassmen with questions about the application process. “I learned so much from her experience [applying],” said Ferraris who now looks to her process when helping other students. “It’s been a long process of applying, but I know I want to head into the medical field,” Upton said. Upton’s four years on the Hill have rounded out an impressive career with much still to come. Her teammates, classmates, coaches and professors all see her succeeding in what she’d like to do. “She’ll do great things,” said Ferraris.